There is no denying to the fact that higher education streams exclusive knowledge as well as career options for the students. Each and every country on this globe has an education system. An enormous divergence can surely be observed in aspects such as how well a country can prepare his/her students by streaming a higher level of education and knowledge. There will be no denying the fact that student’s knowledge and skills play a vital role in the growth of any country. It all depends upon the education system they receive to pursue higher education. 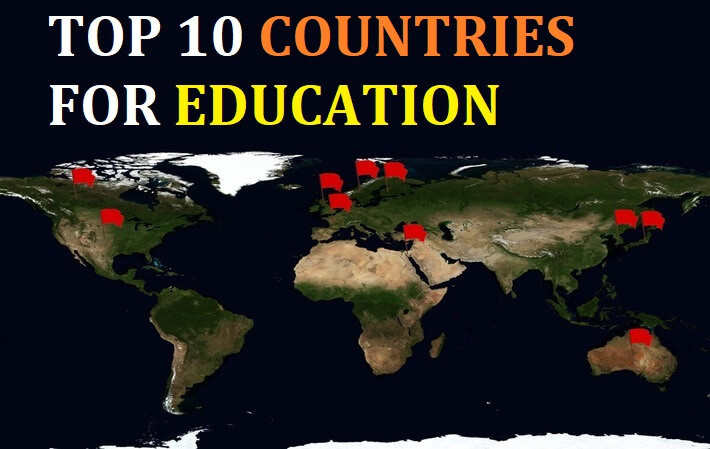 With this article, we’ll let you know about the top 10 countries for education by examining the different systems of education that vary from country to country. The rankings are based on various reputed sources. The UK tops the list of top 10 countries for education. The United Kingdom is known to be a highly evolved and prepped nation that asserts substantial influents in the aspects such as political, cultural incite as well as international economic and political influence. Education and degrees from the UK’s higher education institutes are quite renowned around the world because of the elite and world-class education quality. There are many prestigious universities like Cambridge and Oxford that stream great educational programs. With a rise in online programs popularity, it attracts a lot of international students as well. Currently there are more than 2 million students pursuing higher education in the United Kingdom. Students pursued university programs past year were charged an approx. fee of up to £9,250 annually. Universities in America are popular for their elite quality of teaching as well as scrutiny. About 500000 international students get higher education in the United States every year as this country streams immense opportunities as well as variety in specialties/programs to the students. The overwhelming element to consider is that students also get exclusive internships from the renowned industry heads like Ford, Apple, Google, Coca Cola and Facebook etc. In this way, students tend to catch fruitful job opportunities immediately after completing their internships. Today nearly 30 % of all international students in the globe are educating in the United States. The annual fee of colleges is an average of US$9,970 for state local students and $25,620 for outsiders. Canada is at number 3 in the list. There are nearly 100 universities as well as colleges in Canada. Student’s cost of living and education is comparatively lower in this particular country. Universities here have strict guidelines and demand that needs to be followed. Universities and colleges in Canada have an enormous territory comprising Olympic-level sports facilities, amphitheaters, concert halls, labs, as well as business setups. In the year 2016, a study revealed that 3 Canadian universities were in the list of top 50 universities worldwide. The annual college fee in Canada is nearly $29,947. Studying in Germany is said to be attractive for foreign students because of a variety of bases – firstly, this is a brilliant chance to acquire a cardinal advance education in veteran universities in Europe. The education system in Germany entails a choice between two programs namely German-speaking and English-speaking program. Education in Germany permits students to obtain extra money at local ventures. It unlocks great prospects for students to get a quick job placement soon after graduation. Many students here like to combine their practical as well as theoretical knowledge to gain a better perspective. France is a perfectly ideal place to study and gain a degree in particular stream thanks to its bountiful culture, active student life, architecture and gastronomy. France holds number 5 in the list of top 10 countries for education. The French government tends to subsidize a quite large portion of the real cost of advance or higher education i.e. €14,000 per student yearly. There has been no difference in the fee of French and international students. France’s higher education system includes 3,500 public as well as private institutions. The system as a whole tends to offer impeccable programs at every level and in different disciplines as well. There are more than 1,300 programs in France that are taught in English. Australia is known to be a green continent, where kangaroos can be seen in a large number. Australia has been among the top countries that possess the highest standard of living. Australia has one of the best education systems in the world. As per the University Rankings, the universities like Australian National University, the University of Melbourne, the University of Queensland, University of New South Wales, and the University of Sydney are ranked among the 50 best universities of the world. It has been observed that Australian universities are always enthusiastic about welcoming international students. The expense and cost of education in Australia with an elite level of rank, on average, is almost 30% less as compared to many other developed countries. The highly incredible work opportunities after graduation. There are numerous fields of excellent international educational organizations in a large number of cities of Australia. Switzerland is ranked at number 7 on the list. In Switzerland, there are 12 state universities in several academies and over 120 colleges. They tend to offer to educate students in the fields such as hotel, marketing, sports, science, tourism, marketing and business etc. At most of the widespread universities, the yearly tuition fee for the students is between £650 and £1,000. However, the University of Italian Switzerland tends to charge a much higher fee of nearly £2,600 per year. As per studying in Switzerland, about 25% of the students in Switzerland are international students. There are essential scholarships available for international students. Sweden holds 8th position in the list. However, the Sweden universities tend to have numerous different approaches. These universities here teach students to adopt critical and analytical thinking. The education system of Sweden is internationally renowned. International students from different parts of the world like to study in Sweden, as there are more than 1,000 degree programs that are taught in English. Also the international students can gain work experience while studying. Annually the cost of higher education in Sweden varies according to the different university and program as well. College/university fees in Sweden stretch from nearly SEK 80,000 annually about 8,300 EUR or 9,200 USD to SEK 130. Japan has more than 700 universities to pursue higher education. 10 universities in Japan are ranked in the top 200 universities around the world. There can be observed tremendous academic dedication. In an outline, we can simply say that the quality of teaching is quite high and significant to the Japanese. Tuition fees in Japan are comparatively low and affordable unlike other countries. Japanese colleges or universities cost around 535,800 yen (approx. $5,500) per year. However, there is an enormous variety of scholarships are available for the students, both from the university as well as from numerous public organizations. The Netherlands is on number 10 in the list. It has an enormous and wide array of different English language programs in Europe. There is almost every university that possesses an English variant of any programs that are taught in Dutch. Lecturers in these universities are generally bilingual who can converse in English very easily. There are many courses offered to the students. The education system in the Netherlands is not too expensive like the US and UK. The Dutch education system is backed and funded by the government. For any degree program the annual fee ranges from approximately €1,900 for local EU students and €6,000 for outside EU students. Does studying abroad prepare students for global leadership?